After one year of efforts, the spanish popular legislative initiative for basic income ended without enough signatures to go to parliament. For the past year, a grassroots movement in Spain has been very actively campaigning for the introduction of a basic income by means of a national popular legislative initiative (ILP). Thanks to the efforts of a growing number of basic income supporters, approximately 185,000 signatures were collected – less than the threshold of 500,000 signatures required for the initiative to be examined by the national parliament. The exact number of signatures still have to be counted by national authorities after a validation check. Although the number of signatures collected is considered lower than hoped – organisers said the campaign contributed significantly to spreading the idea of basic income across Spain. 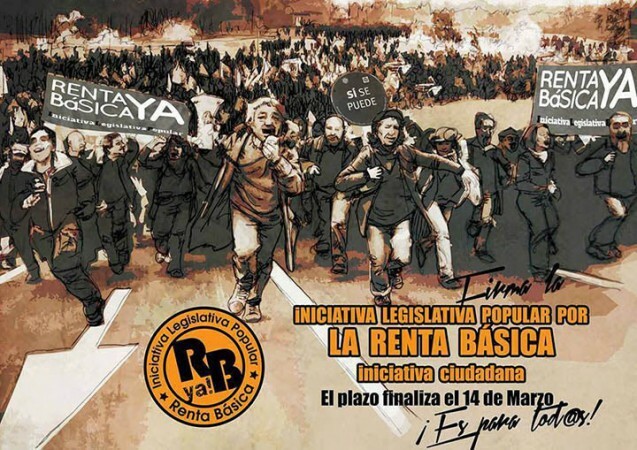 The initiative “ILP Renta Basica Universal” was organised by a grassroots coalition formed at a meeting in Madrid organised during the Summer of 2013. This so-called “Movement against unemployment and precarity – for a basic income now” federated various left-leaning organisations such as political movement Baladre, Civic Front, Dignity Camps, and was later joined by many other organisations and the Green Party EQUO. While the idea of universal basic income was plainly stated in the official text of the ILP and viewed as a civic right, in practice the campaign also aimed at urging the government to implement a means-tested guaranteed minimum income in the short run. This strategy was the result of a compromise between the various organisations leading the campaign. The Spanish Initiative officially started on January 15th 2014, right after the end of the European Citizens Initiative which collected almost 300,000 signatures at the EU level and ended on January 14th. 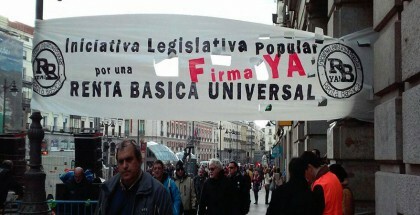 The period of signature collection started two months later on March 14th, and was immediately followed by an important participation in the “Dignity Marches”, a broader anti-austerity demonstration involving more than one million people who converged on the Plaza del Sol, the Central Square of Madrid on March 22nd. This was a tactical move to spread the idea of basic income among social movements in Spain. Unfortunately, just like the European initiative, the Spanish campaign suffered from the burdensomeness of the legal procedures required to make a successful initiative. In the case of Spain, it is extremely complicated to collect signatures electronically. In fact, over the last 30 years, only one popular initiative have successfully reached the threshold of 500,000 signatures to be examined by the spanish parliament. It was an initiative aiming at protecting victims of the mortgage crisis. For a few months now, the idea of basic income has been in the forefront of political debates in Spain, a development largely due to the series of efforts provided by BIEN’s affiliate Red Renta Basica, the European Citizens Initiative, the ILP campaign and the impressive rise of Podemos. To celebrate their achievements, activists gathered last Saturday on the central square of Madrid. “The goal of the initiative was more about generating 500,000 conversations about the concept of basic income rather than just collecting the signatures” activist Jorge Martín Neira said. While activists look determined to follow up, it is difficult to predict the destiny of the leaderless, diverse and decentralized movement which was founded for this campaign. Inasmuch as I am somewhat familiar with and do respect your work, I would like to discuss with you, at your convenience, some of the opportunities presented by the general public’s increasing awareness of the always present but growing economic inequalities throughout every country, corner and continent of our potentially pleasant Spaceship Earth. Over forty years ago this writer, and would-be Societal Engineer, was given the specific ideas of Socioeconomic Democracy. A history of the development and presentation of these ideas is available in our Bibliography (see below). This planet’s trivially eliminated or significantly reduced societal problems, by realizing Socioeconomic Democracy, include but are by no means limited to, those familiar ones associated with Automation, computerization and robotics; Budget deficits and debts at the personal, national, regional and global levels; Contempt for much presently practiced politics; Costly crimes and costly prisons, both governmental and corporate profit-motivated; Corporate profit-motivated as well as general publicly expensive exogenous pollution; Inadequate public education for all ages, “races”, and both sexes of humanity; Oversights and confusions of some, but certainly not quite all, Economists and Politicians; Ignoring the elderly, to whom we all owe our very existence; International costly conflicts; national costly conflicts; Involuntary employment; Involuntary unemployment; Lack of access to necessary physical and psychological healthcare, causing unnecessary harm to the individuals themselves, their “close” relatives, and many “innocent bystanders”; Pay injustices to both sexes, all ages and all “races” of our human family; Corporately profitable yet publicly costly “Planned Obsolescence”; Political non-participation, carefully planned, designed, legislated and realized by some, but not all, power-intoxicated politicians; Population explosions; Post Traumatic Stress Disorder (PTSD) caused by “patriotic” and/or pathetic human-killing wars, as well as all the PTSD created by all the other unnecessary societal problems; Voting district gerrymandering; Needless and obscene poverty, racism, sexism, and everything else that effectively opposes, neglects or negates the General Welfare. I was basically ciuuors about if you ever considered changing the layout of your website? It is very well written; I enjoy what you have got to state. But maybe you can include a little more in the way of content so people could connect to it better. You have got a great deal of wording for only having one or two photos. Maybe you can space it out better? That is complicated at the moment (thanks for the suggestion, though). All our present efforts are going towards keeping a steady flow of articles, to the highest degree of quality we can manage.